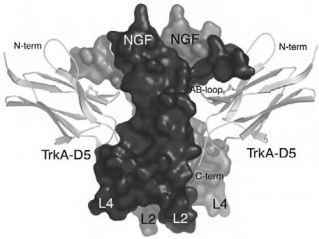 Figure 2 Crystal structure of the NGF-TrkA-D5 complex. NGF is rendered as a solvent-accessible surfaces (dark and light gray) and TrkA-D5 as a gray ribbon with the disulfide bond buried in the interface; NGF is shown as a ball and stick. The first and last ordered D5 residues are labeled "N-term" and "C-term", respectively. In this figure and in Fig. 3, the cell membrane would be at the bottom. axis perpendicular to the membrane, with its termini and the cystine-knot motif at the top and the three hairpin loops L1, L2, and L4 facing the membrane (Figs. 1B, 2). In this crystal structure, D5 is correctly folded, and the A/B loop is tightly packed against NGF. While ligand binding does not induce any significant differences in D5, NGF undergoes an important change. The N-terminal residues of NGF, which are known to be critical for receptor binding and are flexible in all crystal structures of neurotrophins in their unbound state, become well-ordered in the NGF-TrkA-D5 complex. The NGF N terminus now forms a helical turn (Fig. 1), which packs tightly into a hydrophobic pocket on the surface of D5; interestingly, the unusual disulfide bridge found in D5 but not in other I-set members forms the bottom of this pocket. A comparison of the D5 structures of TrkA, TrkB, and TrkC reveals that the residues lining the walls of the pocket are not conserved; therefore, the interactions in this patch are likely to confer specificity between the ligands and their receptors . 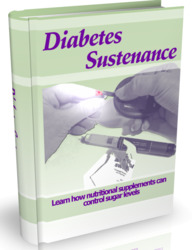 A second binding patch involves residues from the central portion of the NGF dimer. 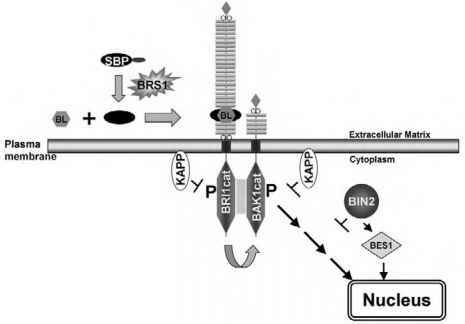 Most of the residues involved in this part of the interface are conserved among both the neurotrophins and the receptors, and similar interactions were predicted for all neurotrophin-Trk complexes . Finally, loops L2 and L4 at the bottom of the NGF dimer (Fig. 1B) share very little sequence conservation and are known from swapping experiments to be important for specificity . Neither of these loops is in contact with D5, but the C terminus of D5 projects toward the groove between them. Therefore, in the native complex with intact TrkA, a portion of the linker segment connecting D5 to the transmembrane helix could interact with these loops, consistent with the observation that deletions or certain point mutations in this segment result in decreases in neurotrophin binding. Figure 3 Model of a ternary NGF-TrkA-D5-p75NTR complex. All components are rendered as solvent-accessible surface, with NGF in medium gray, TrkA-D5 in black, and p75NTR in light gray. 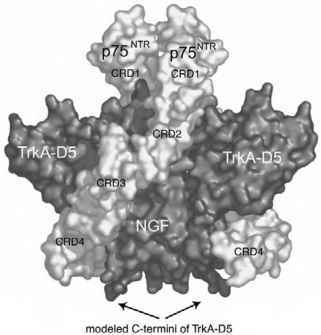 The C-terminus of TrkA-D5 was modeled to interact with hairpin loops L2 and L4 at the bottom of NGF; in this model, it also interacts with CRD4 of p75NTR.